How to advertise Mathematica careers to users of this site? I am looking to fill two permanent Mathematica developer positions. I think that many of the users of Mathematica.SE would be interested in a dedicated careers site, but I don't know how to reach them. I would guess that StackOverflow Careers isn't visited by everyone here. Any ideas on how to advertise Mathematica job opportunities to SE users? The main message of this post is a plea to the StackExchange team, concerning better integration between our site and Careers.SO. I've joined the Mathematica tag on SO (while we were on SO) early enough to witness and contribute to the development of our community since the early stages, and I think that such better integration will be of a great mutual benefit for both us and SE. I would add to the answer of Szabolcs (which I completely agree with), that our (Mathematica) community is unlike any other SE community with a dedicated site (as opposed to StackOverflow), because I believe that our community here is in a large part a programming community. It is not just that (and that's why we have a separate site), but the programming aspect is crucial. So, many of us are programmers (some in addition to being researchers or educators or industry professionals), and yet as a community we currently don't benefit from Careers.SO, unlike all those gathered in various tags under SO umbrella. This is because the SO Careers site is not integrated with Mathematica SE, and so the potential employers (such as the OP of this question) don't see any potential candidates, while those of us here who are looking for a job have currently vanishingly small chances to see any open Mathematica development positions in a timely manner. At the same time, Wolfram Mathematica, being the best (in my opinion, but it is shared by lots of people) techincal computing platform today, has millions of users and thousands of commercial users, and the user base is rapidly expanding. Each new version brings about a huge number of new features, and Mathematica as a programming language /platform is currently in the process of rapidly moving from being (perceived as) a rather specialized software for doing Mathematics to a general-purpose computing environment used by a growing number of industries. I therefore expect that the number of Mathematica jobs will grow rather rapidly in the next few years. So, SE team, this is a call for you: support some ways to better integrate our community with the Careers SO site, provide ways for employers looking for Mathematica developers to connect to Mathematica.SE users, and you won't regret it! As of now, there's a grand total of — 1 job in Mathematica on careers.stackoverflow! Great. It's pretty heavy on Java/PHP/Ruby/C#, etc., and all the jobs near me are mainly in these areas — stuff I'm the least bit interested in. This is not in any way a criticism of SE; it's just the harsh reality of the situation in the real world. SE can add a careers link from our home page (just like on SO) and clicking on that takes you to a page showing only users with Mathematica skills and jobs needing Mathematica expertise. 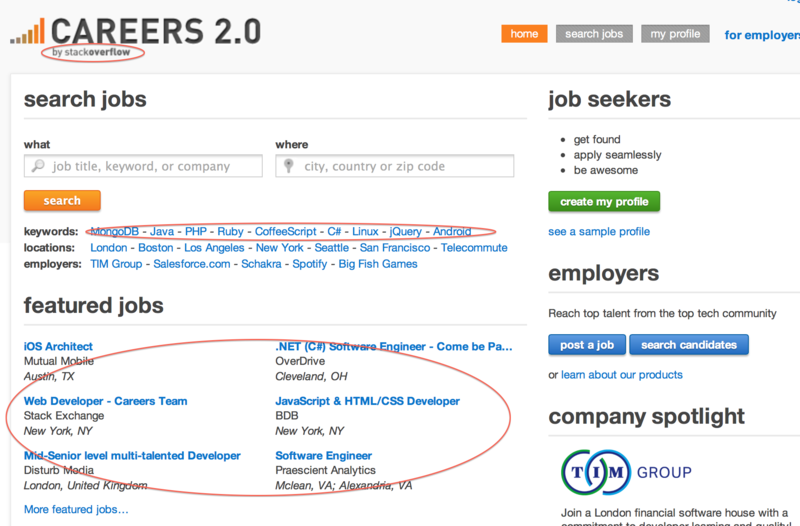 We could have a beta phase (just like for the site) during which employers (who are active here or are prowling this site) can add jobs listings and users of this site can add their completed profiles. Once there's a critical mass, the link can be added to the page permanently. Partner with WRI to increase reach to the industries/universities that rely on heavy computations. This is an area where WRI is lacking (compared to The Mathworks), and some kind of mutually beneficial agreement could be arrived at. Publicize at scientific conferences/workshops/etc. — the typical places you'll find a Mathematica user. I've been told that the current careers2.0 design allows users to add answers from any SE site, so technically one could use it to advertise their profile. Yet, adoption is very low among our members because no one considers it a viable medium for job hunting. There are at present 351 profiles that list Mathematica in their skills list (some of you might recognize them from the locations), but they are mostly token profiles created because they received an email from SE when we were still a tag on SO. I think making the site attractive to the community would go a long way in getting users to adopt it. Considering that there is no equivalent of a jobs site for Mathematica users, it would even give SE a good head start over the competition (if and when it launches). If Stack Overflow Careers could get a little more support for Mathematica / Mathematica.SE (as RM mentioned in chat), a first step would be placing an advertisement on Mathematica.SE linking to Mathematica-related jobs on Careers. Probably most people here don't know about the Careers site yet, or don't expect it to be useful for Mathematica-related jobs, so never look at it. First we'd need to make sure that there are job announcement there (like yours), then let Mathematica users know about it through an ad. P.S. Personally I think that it's not really important how exactly this is set up, through Careers or another site, but something is definitely needed, and I believe it would be popular. Can we get the twitter bot to tweet to #mathematica?